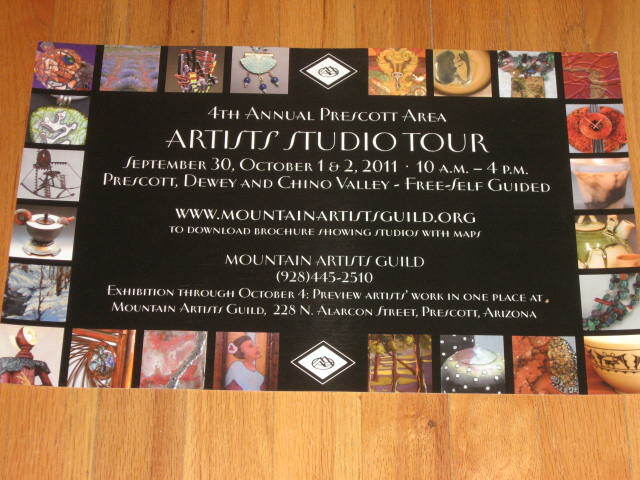 It’s a huge weekend + for my husband and me…starting with the Mountain Artists’ Guild Studio Tour from Friday, September 30th through Sunday October 2nd. It’s the 4th annual show, yet my first year as a participant…and my first jurried show! The Sharlot Hall Museum’s annual Folk Music Festival is also happening, which I love attending, but evidently not this year! My husband always participates by playing music and also by giving workshops. He will also play at the Contra dance that night and most likely will jam with traveling musicians long into the wee hours. For more Sharing of Joy, visit Meri @ http://meriak.blogspot.com/. ~ by Dawn Elliott on September 28, 2011.
this will be a whirlwind weekend for you both! i wish you great success at the studio tour. i am certain you will all have a great time! what could be better than art, music and friends??? Yes, indeed the joy of music and happiness it brings.! Have a wonderful day! wonderful weekend coming! enjoy it! do tell which musician is your sweetie? thats a great photo! My husband – by far the youngest member of this band – is hidden behind the microphone! 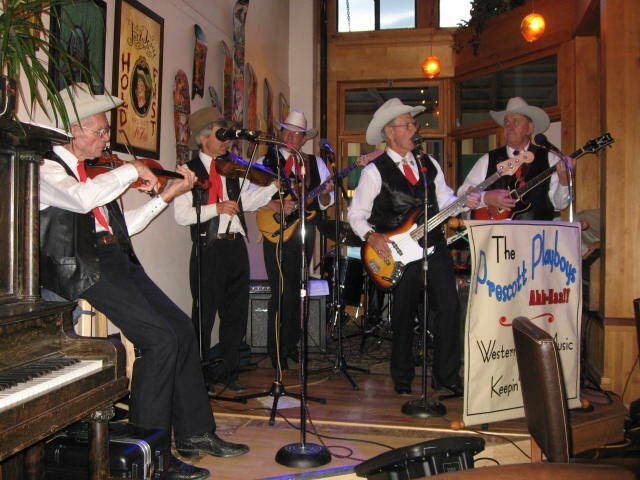 This was when he played fiddle with the Prescott Playboys…so he could experience country music for awhile. His favorites are Irish, folk, and Ragtime music…on the piano! Sounds like it is going to be a fun fun fun time. Enjoy the studio tour and good luck. I’m sure you will do just great. Please take pix od NM, I am just longing to see more of NM. Have a great time and take care. Gosh, does that look fun! Submersion in music and art, all in one weekend. What could be better? Well aren’t you the lucky one with a fiddle playing hub, my fave is Irish too. Have a joy filled week!